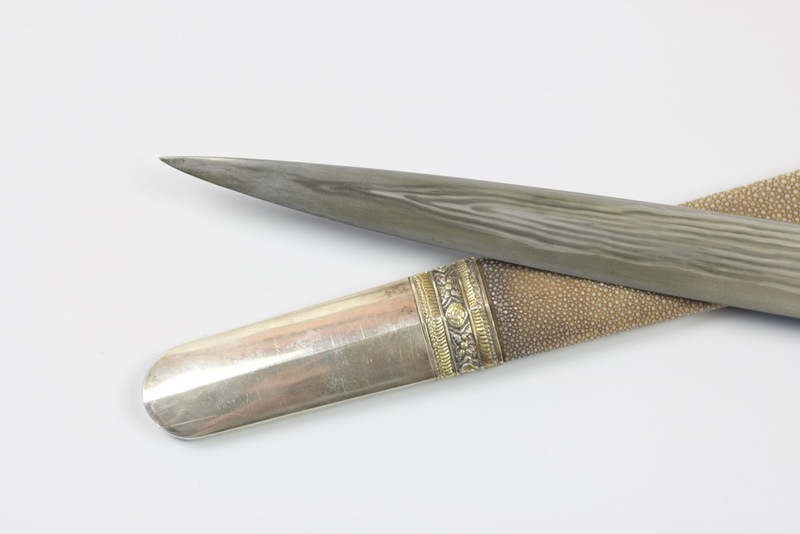 Bhutan is home of two main types of knives, the dozum and the patag . 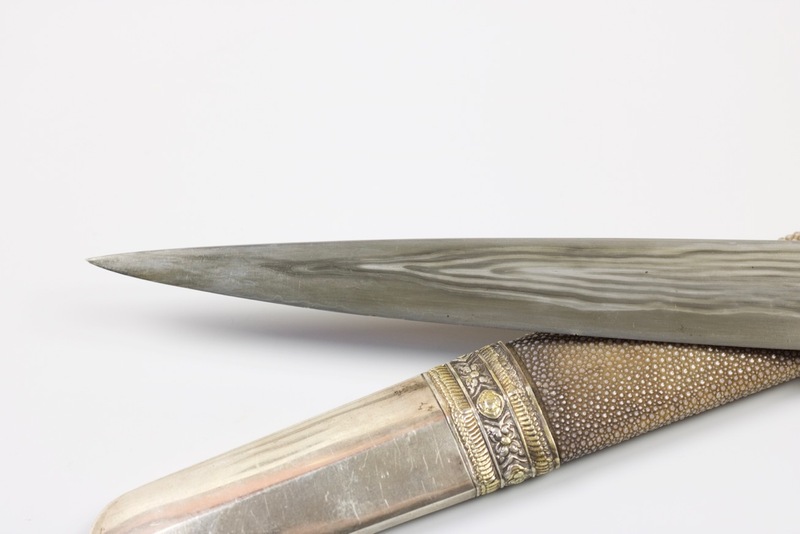 The patag can be short to sword length, and is characterized by having a blade with an angled chisel point. 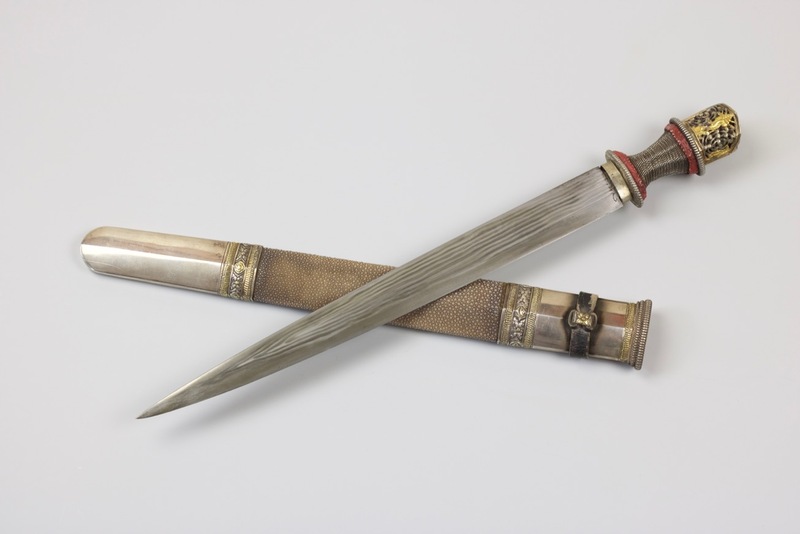 The dozum is a short dagger with a blade that gradually narrows to an acute point. 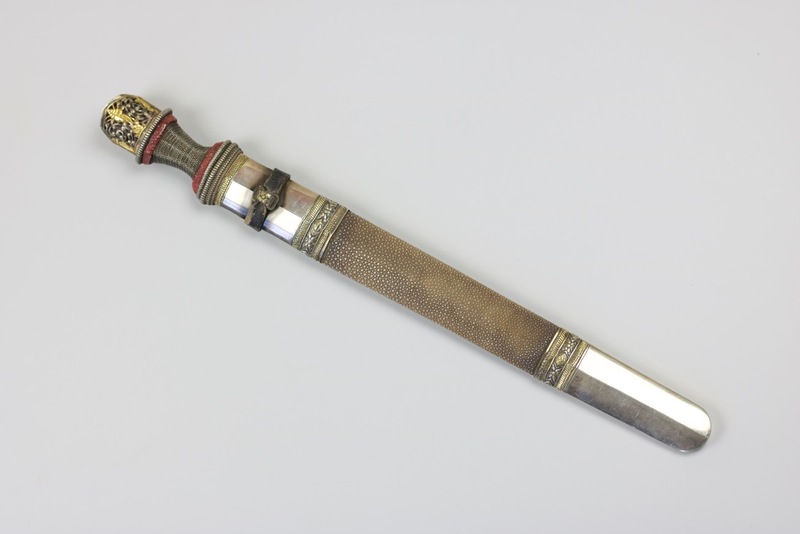 Ornate patag of sword length where customarily worn by the aristocracy and senior government officials. We have a patag for sale here. 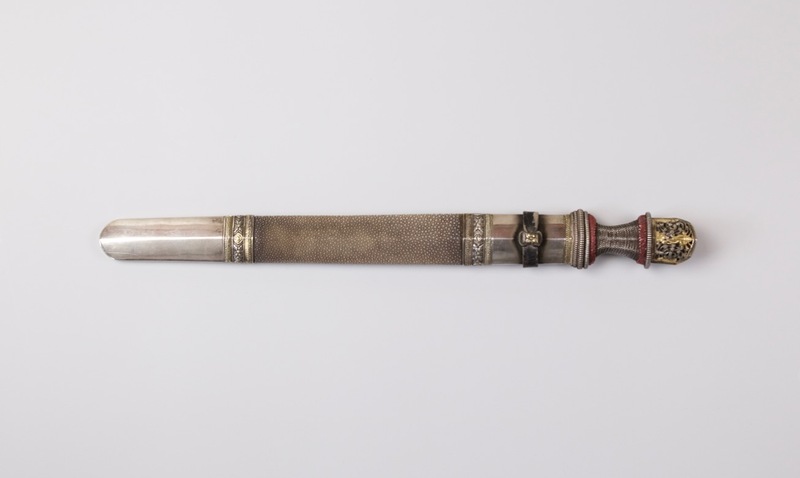 The dozum is still worn as part of a Bhutanese man's attire up to today. 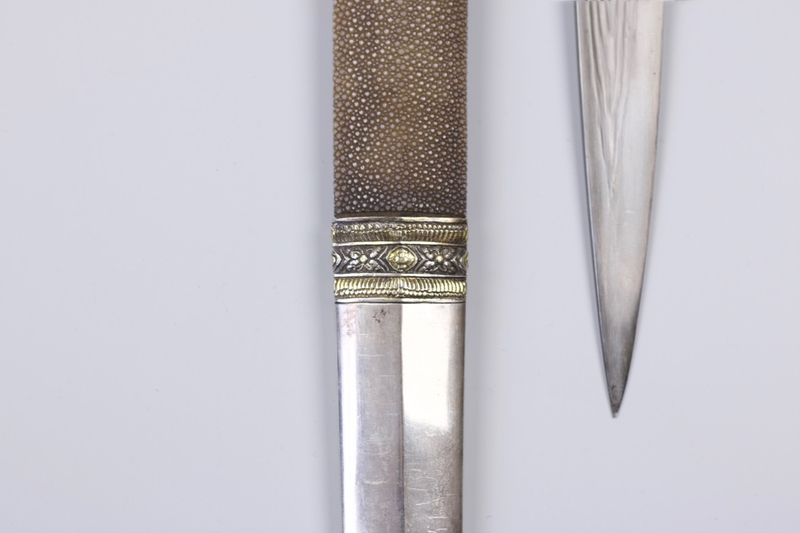 Usually a simple utility knife with a soft wooden sheath, but some of them were works of art. 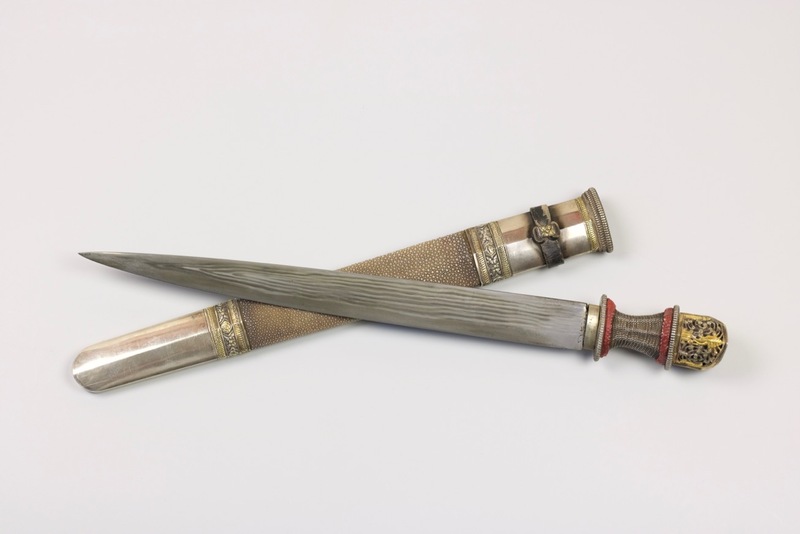 The are customarily worn horizontally in front of the belly, rolled into the traditional garb, unseen, or separately carried on the left side, rolled in fabric with the pommel exposed. 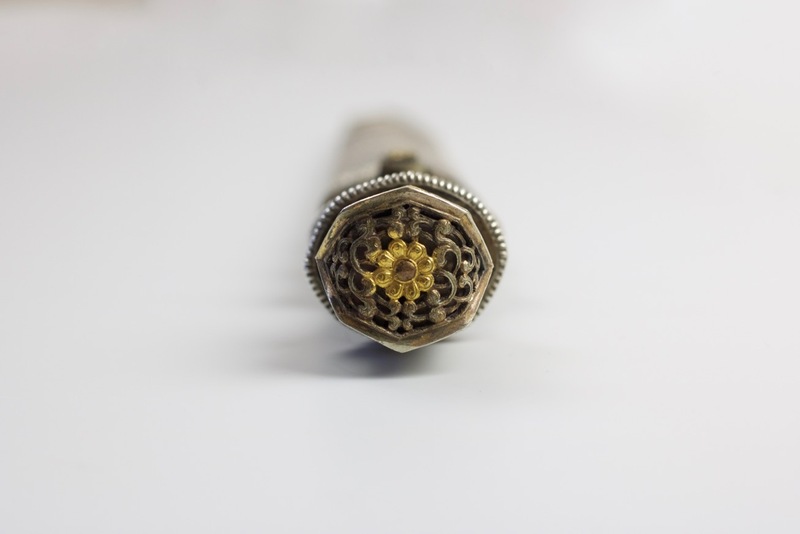 Due to several dialects and transliteration systems, dozum are alternatively referred to as: dossum , doo zum , dro zom or dudzom . 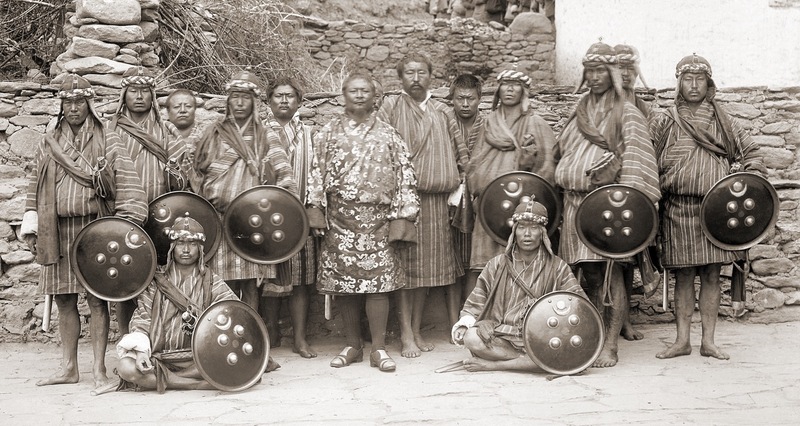 Sir Ugyen Wangchuk and his bodyguards, photographed in Bhutan in 1905 by Sir John Claude White. 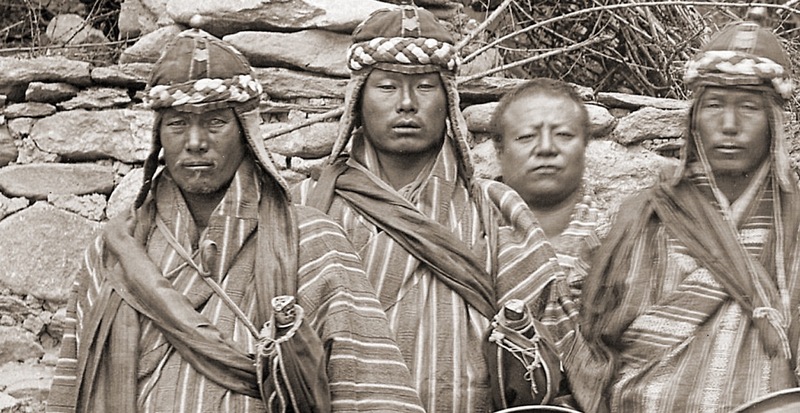 Sir Ugyen Wangchuk was a fascinating figure who was to become the first Druk Gyalpo (King of Bhutan) from 1907-1926. 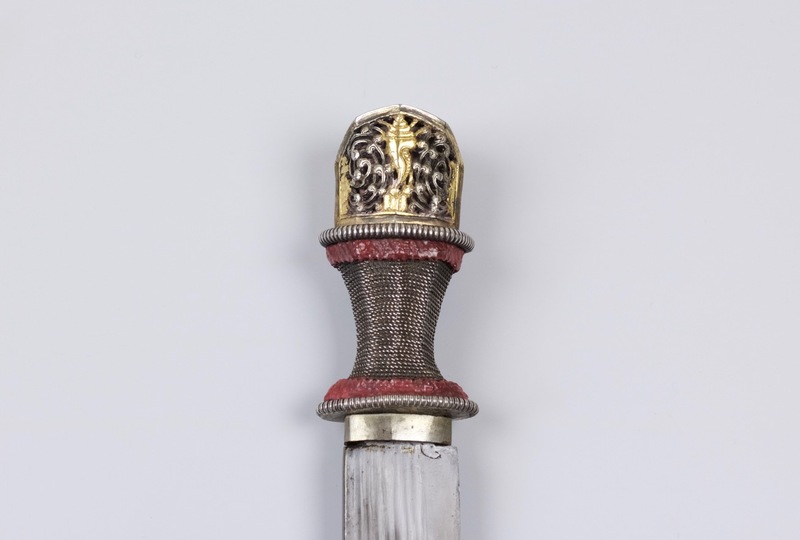 His guards are wearing patag on their right sides and on their left you can see the pommels of dozum exposed from the fabric they are carried in. 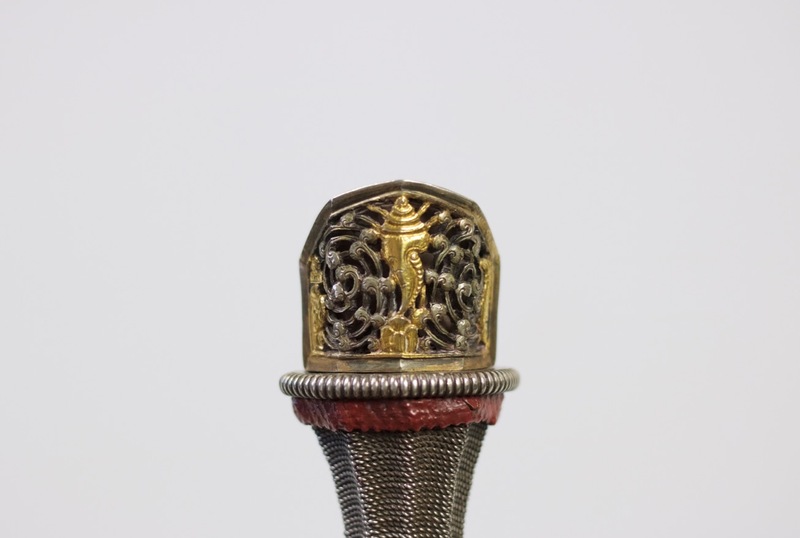 Close-up of the two guards on the left, showing the pommels of their dozum . 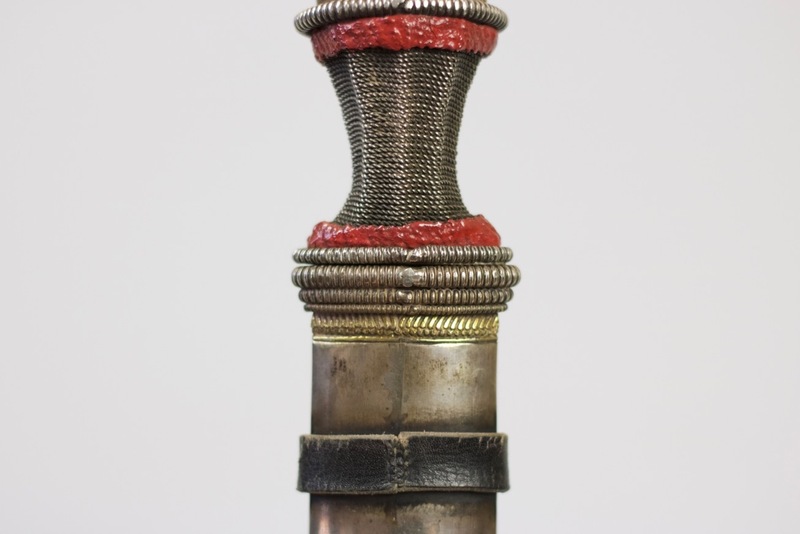 Compare to the pommel of the example discussed in this article. 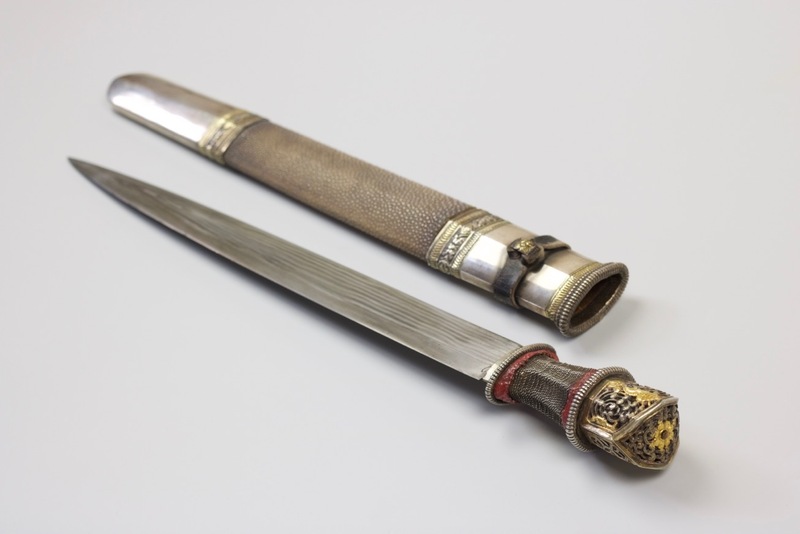 Presented is a Bhutanese dagger or dozum of unusual quality. 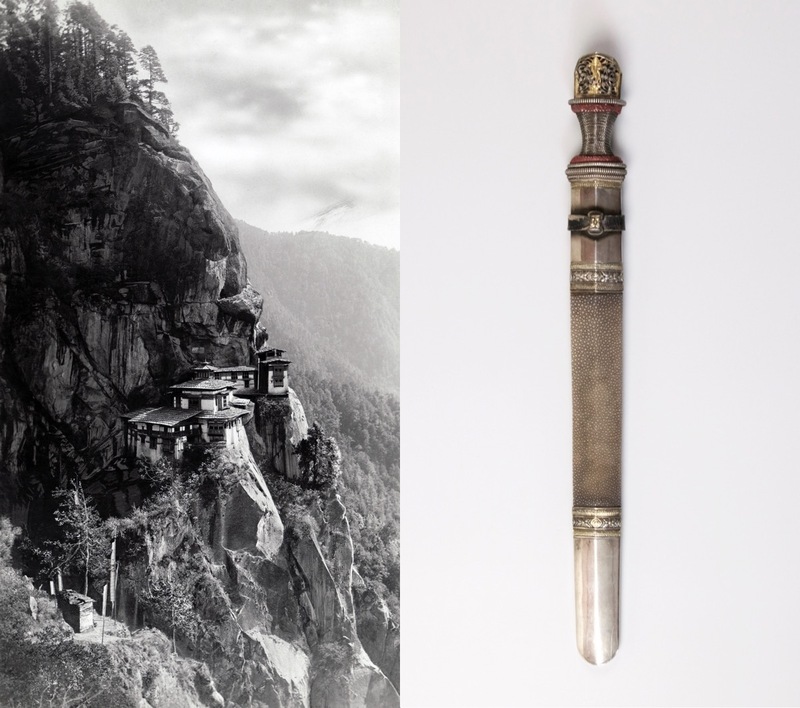 The substantial blade of hairpin forging typical for the Tibetan cultural sphere including Sikkim and Bhutan. 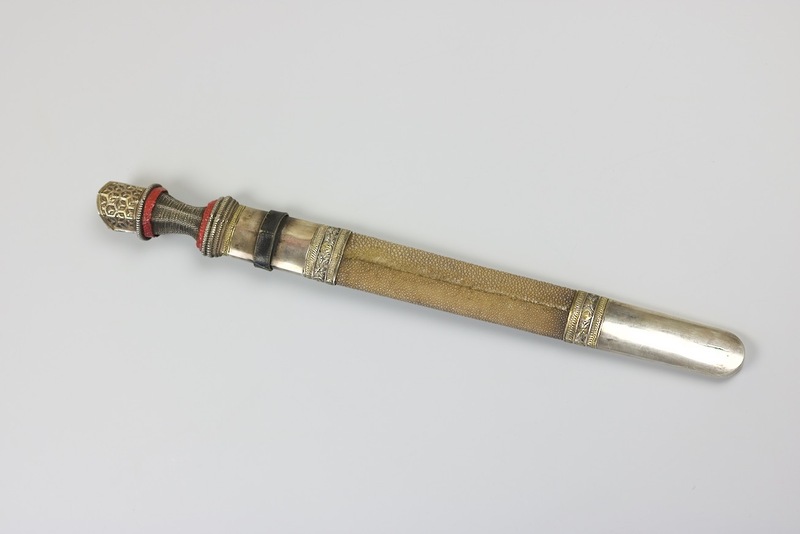 Typical for Bhutanese work, the hairpin laminations are brought out to a relief with a combination of tools and etching. 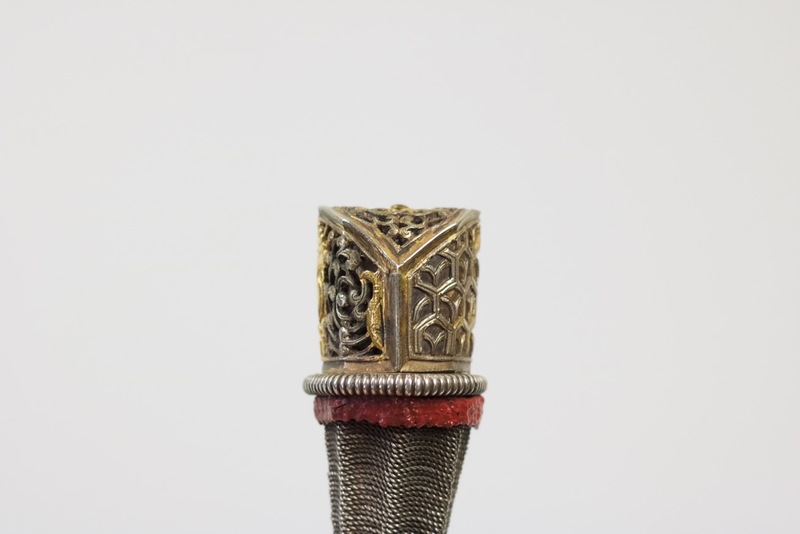 Tight forging throughout, without the forging flaws you often encounter on arms from the Himalayan plateau. 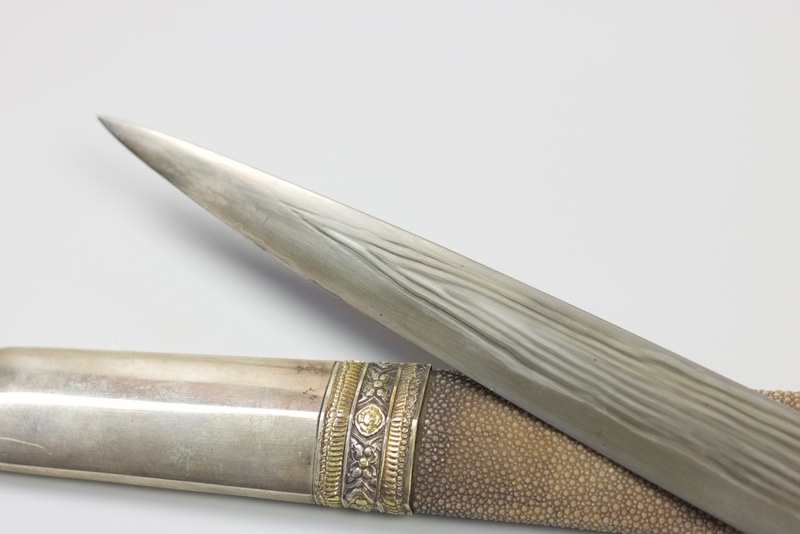 Heavy mounts executed in silver, much thicker than the usual silver sheet encountered on Bhutanese daggers. 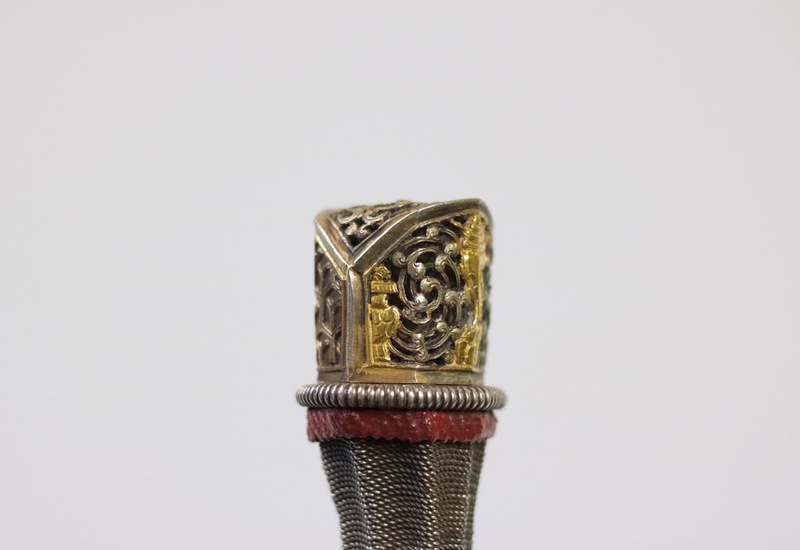 Pommel and scabbard ornaments with parcel gilt details, with most of the gold in excellent condition. 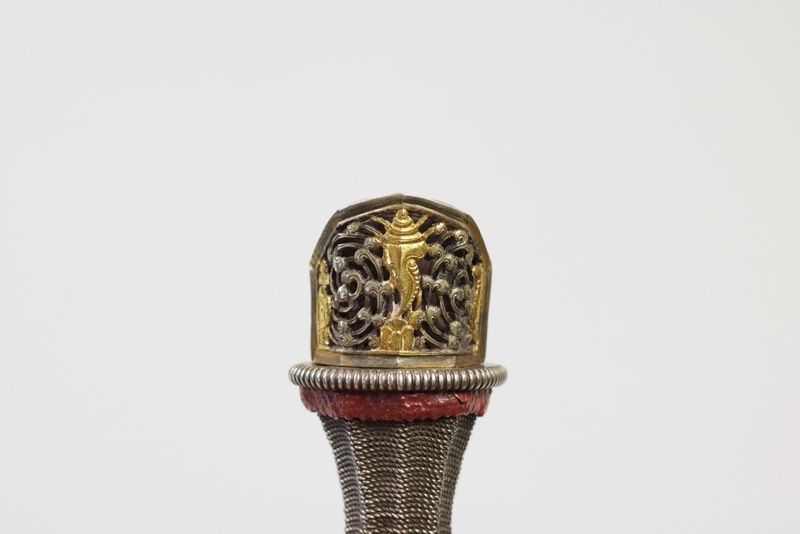 The pommel is decorated with fine openwork of scrolling foliage around three auspicious Buddhist symbols: The conch shell, flanked left and right with the vase and fish. 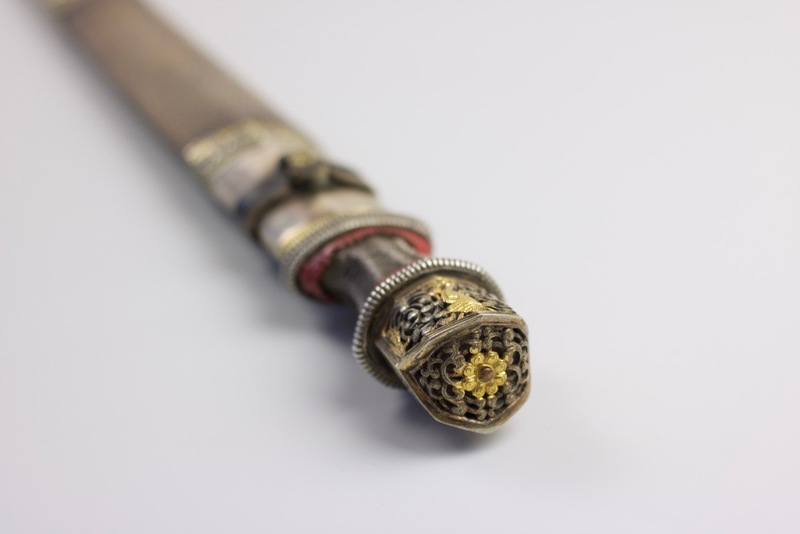 The Conch Shell stands for the Buddha's teaching spreading in all directions like the sound of the conch trumpet, awakening his subjects from the deep slumber of ignorance. 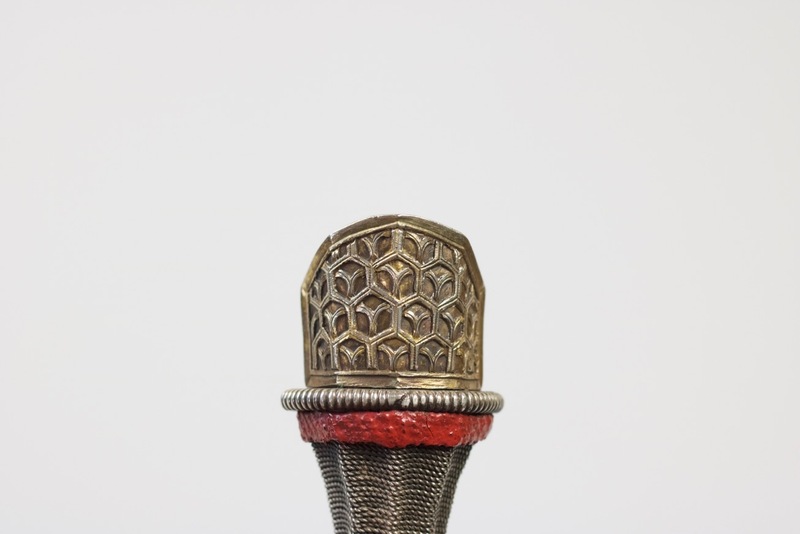 The Vase of Treasure symbolizes long life, wealth and prosperity and all the benefits of this world and liberation. The fish symbolizes moving freely and spontaneously, without fear of drowning in the ocean of suffering. 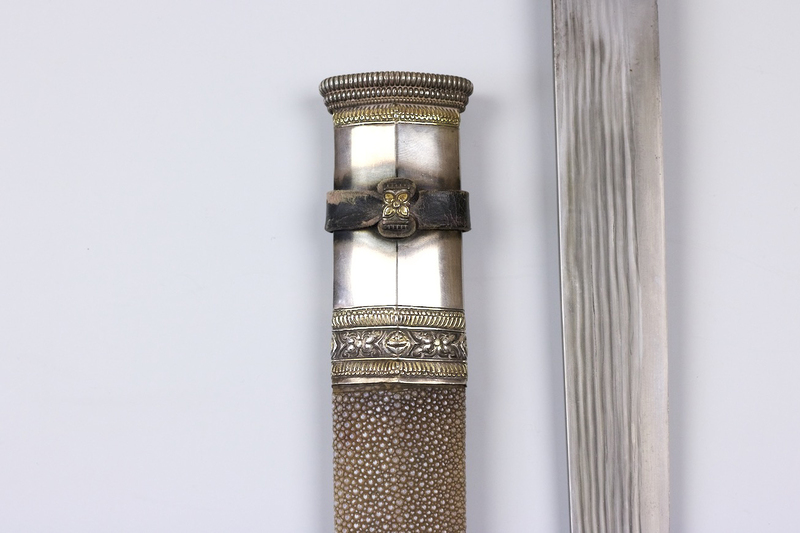 The back of the pommel is decorated with a single, golden blossom amidst silver scrolling foliage. 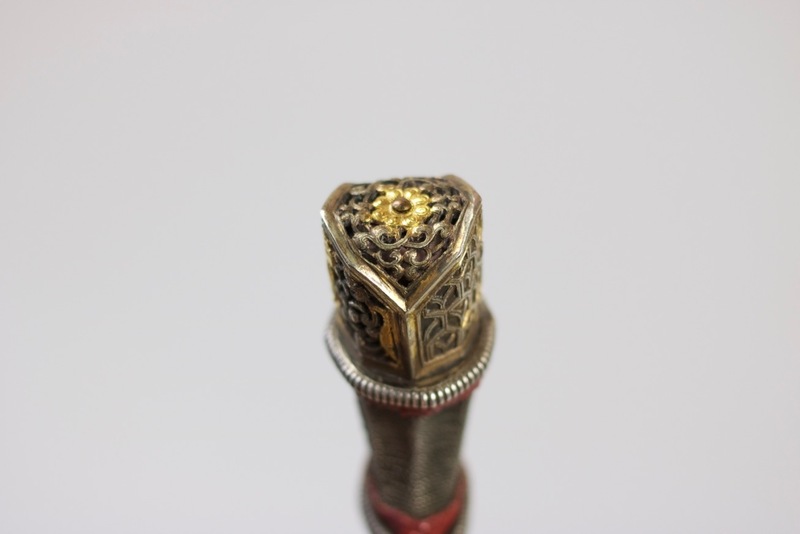 It symbolizes autumn, and the gathering of harvest: a metaphor for achieving enlightenment. 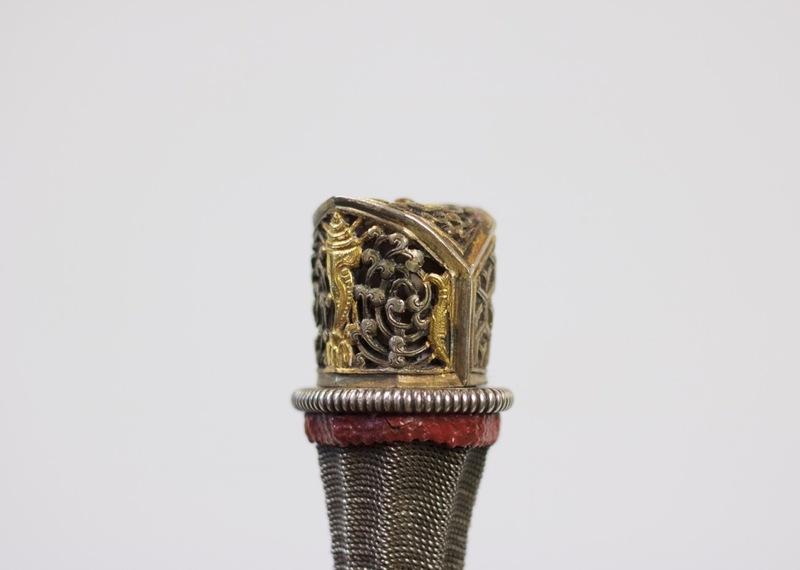 The handle is wrapped with silver wire, with red lacquered cord on either side, bordering ribbed decorative washers. 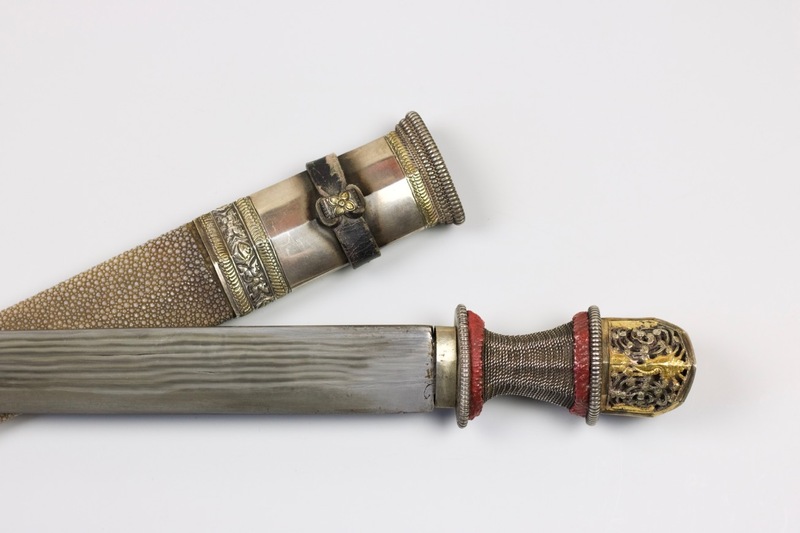 The wooden scabbard fitted with silver mounts with a very well defined center ridge line, further decorated with flowers and lotus petals, parcel gilt details. 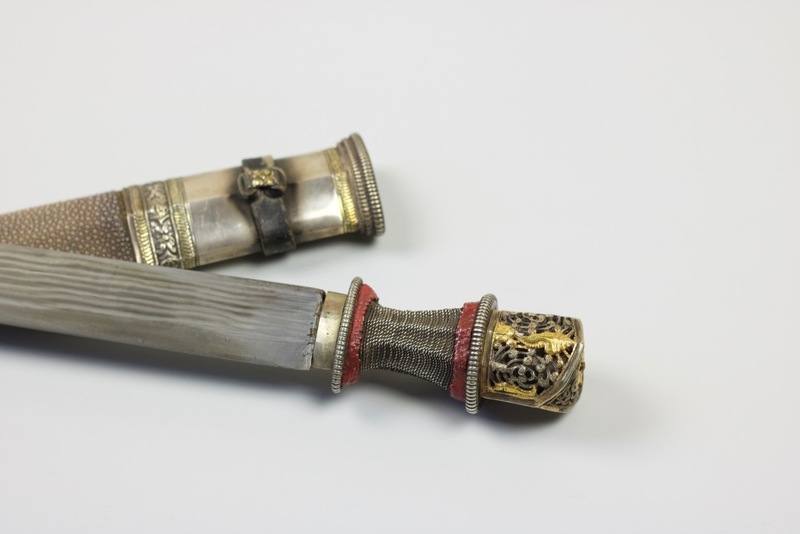 You can feel the considerable weight of the silver in handling the scabbard. 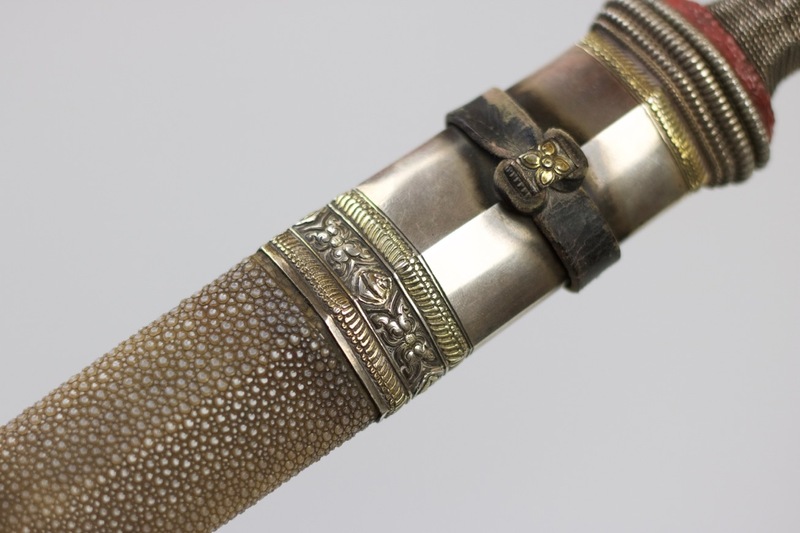 The upper fitting still retains its original leather strap. 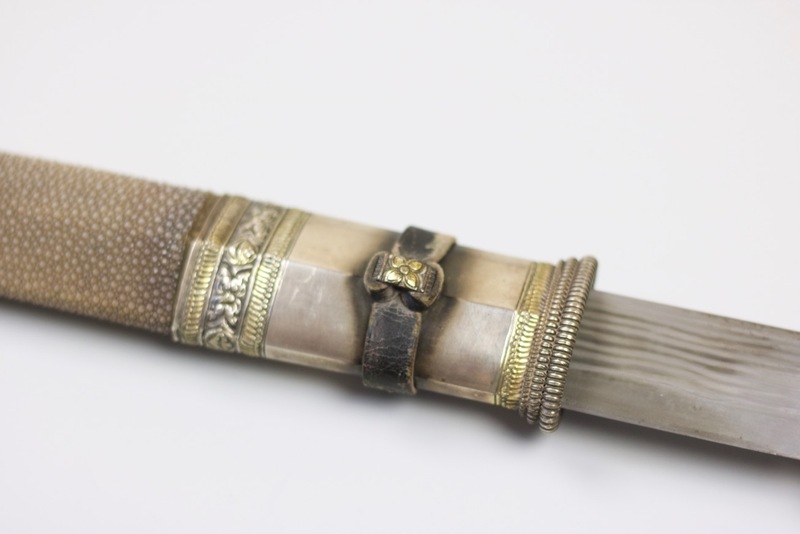 The mid-section of the scabbard is covered with ray-skin rawhide from the Southeast Asian stingray. 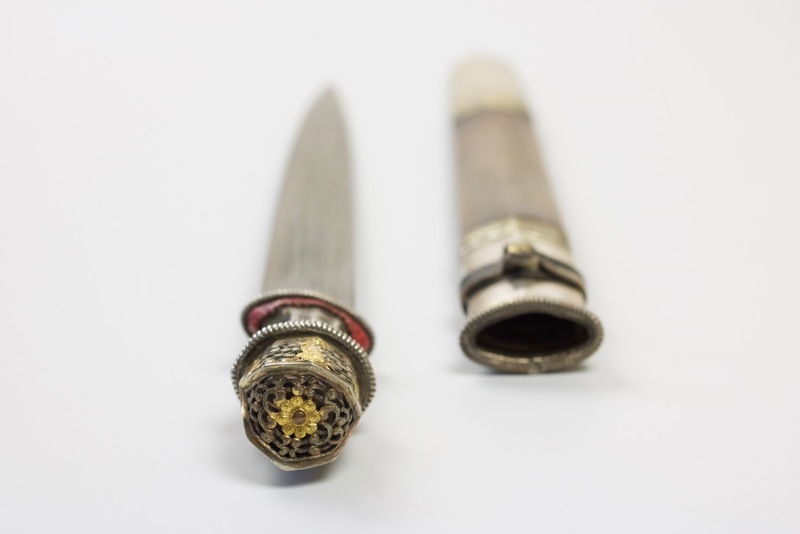 Known for its durability, it was an exotic and highly prized material in the landlocked Himalayan kingdom of Bhutan. 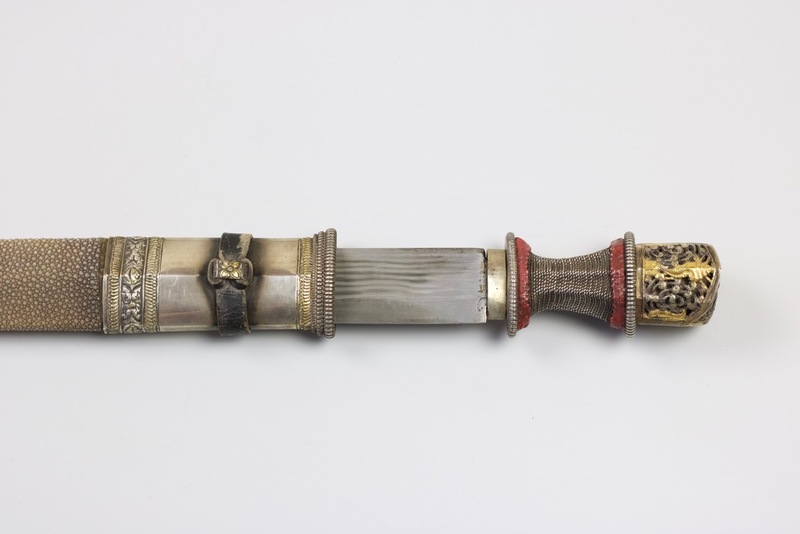 An exceptional Bhutanese dagger with heavy silver mounts of fine workmanship. 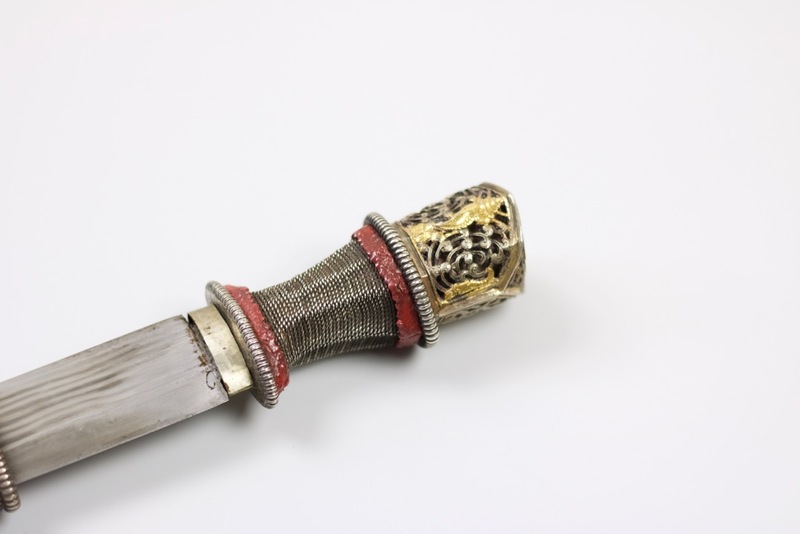 It is of a quality rarely seen on the market and must have been commissioned by a person of considerable wealth and status. Complete and in excellent condition.